Echinacea is a centuries-old natural remedy for the flu and the common cold, and the medicinal uses of the plant are believed to have first been recognized by Native Americans. While echinacea tea may be most known for its anti-viral properties, it offers a host of other benefits for a healthy lifestyle as well. Echinacea is usually referred to as coneflower, but it has a variety of names in common usage, including snakeroot, comb flower and hedge hog. It is most commonly found in the Rocky Mountains and Great Plains regions and can grow up to two feet tall. It’s often grown for its vibrant flowers, which usually bloom in June and July. 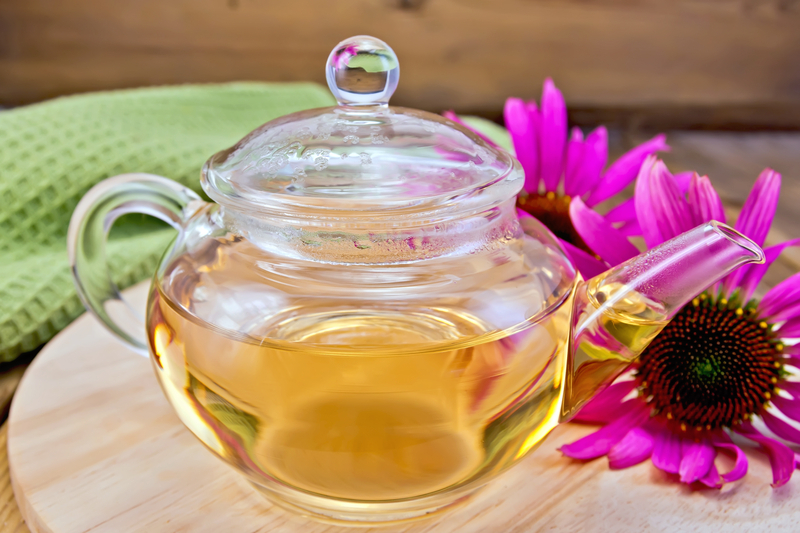 What Is Echinacea Tea Good For? 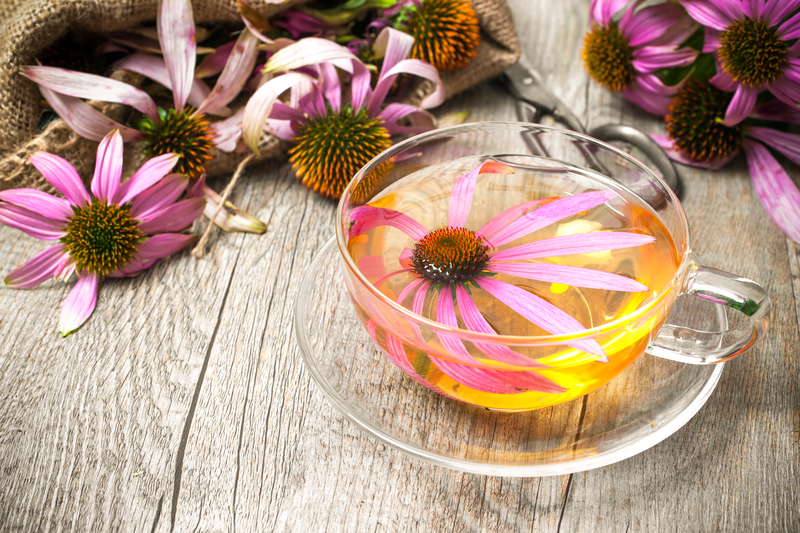 While herbalists may recommend tinctures or extracts in the above treatments, echinacea tea is an easy, convenient, and tasty way to reap the same benefits just by adding a cup to your breakfast and before-bed routine. What Does Echinacea Tea Taste Like? Pure echinacea tea has a very strong flavor which increases the longer the tea is left to steep. It has a decidedly floral taste and aroma and can leave your lips and mouth with a tingling sensation. However, echinacea tea, especially commercially prepared brands, is most often mixed with a variety of other herbs designed to temper the flavor and add a natural sweetness. Elderberry is commonly paired with echinacea to create a tea that packs a power punch against the viruses responsible for the common cold and flu. Pairing echinacea tea with a mint, such as spearmint or peppermint, can help soothe a sore throat and clear the sinus passages. Fresh lemon or citrusy herbs, such as lemongrass, can provide extra vitamins and antioxidants as well as enhance the flavor. Echinacea’s anti-viral properties are what make it effective in treating and preventing the common cold and flu. Echinacea is also sometimes used to treat vaginal yeast infections, and its overall anti-inflammatory effect on the body promotes balance in the mind, body, and spirit. Echinacea works by stimulating the immune response in the body, and it contains several different chemicals that play a role in this process, including glycoproteins, polysaccharides, alkamides, flavonoids and volatile oils. The top parts of the plant, including the stem, leaves and flower, have higher concentrations of the polysaccharides which are responsible for increasing the body’s immune response. Are There Any Side Effects from Echinacea Tea? Pregnancy and breastfeeding. As with many types of herbal tea, there has not been enough scientific study done to positively conclude whether echinacea tea is safe for pregnant and breastfeeding women. However, most practitioners consider it OK for pregnancy, and at least one study published in November 2000 found no difference in adverse outcomes for pregnant women who had consumed echinacea. Babies and children. Echinacea can usually be given to children over the age of 2. However, an allergic reaction is likely to be more severe in younger children, which is why some health care providers recommend children be at least 12. Allergic reactions. If you are allergic to any plants in the daisy family, including marigolds, ragweed, and chrysanthemums, there may be an increased chance of an allergic reaction after consuming echinacea. A history of other allergies or asthma may also increase the risk. Prescription Medications. Echinacea can change the way prescription medicines are processed by the body, leading to the possibility of increased adverse effects. Immunosuppressants and medications changed by the liver are two categories to be especially careful with. Caffeine. Echinacea can decrease the speed in which your body is able to break down and process caffeine. Because of this, it’s best to avoid or strictly limit caffeine while also taking echinacea. As always, it’s important to discuss any treatments, natural or otherwise, you are considering with your doctor beforehand, especially if you are taking prescription or over-the-counter medications. If you are making tea from your own plants, harvest the flowers — petals, leaves and roots can all be used — in summer shortly after the plant blooms. Make sure to cover the stems with petals before hanging to dry to catch the petals as they drop. Once the plants are completed dried out, they can be stored in air-tight containers in a cool, dry room. To make the tea, take one to two teaspoons of the dried petals, leaves and/or roots and steep in boiling water for 15 to 20 minutes before straining, cooling and drinking. While dosages have not been studied extensively, 300 mg of dry powdered extract daily for an adult is generally regarded as safe. Older children and teens should try to stay at or under 150 mg per day, while young children should consume less than 75 mg per day. Where to Buy Echinacea Tea? If you’re more interested in the convenience of a store-bought, commercially prepared tea, Traditional Medicinals, Celestial Seasonings and Yogi are well-known brands that offer echinacea blends. Yogi and Celestial Seasonings blend their echinacea with elderberry to increase the immune-boosting benefits, while Traditional Medicinals adds spearmint and lemongrass to help with taste and provide a menthol effect to clear sinus passages. These brands can be found at most brick-and-mortar stores as well as online retailers. If you’re looking for a natural way to fight the common viruses that come around during cold and flu season, echinacea is a good bet. It’s easy to find and prepare and can be consumed on a daily basis for up to eight weeks. It’s beneficial for those who are already sick and wanting to shorten the duration of the illness as well as those looking to prevent infection. Our favorite thing about this tea is its immune-boosting properties, particularly its effectiveness against viruses which cannot be treated by antibiotics. We also like its blendability with other herbs, giving you an almost-limitless combination of flavors and aromas to choose to make the best of this tea. There are at least nine separate species of echinacea, but the E. purpurea , E. pallida , and E. angustifolia types are most common in medicinal use. Echinacea contains compounds that are poisonous to insects, namely houseflies and mosquitos, and it is sometimes used as an insecticide for sunflower crops. Echinacea gets its name of snakeroot from its use in the 1800s as a remedy for rattlesnake bites.